Ooey gooey. Sticky icky. roley poley doughey ohey puffy uffy BREAKFAST ROLLS! How obvious would you say it is that I work with three-year-olds? These buns. Rolls. Cinnamon-glazed to sticky icky. They’re soft and appley and homemade. We make the dough ourselves. We use yeast. Sounds a little scary, but it’s totally not. You can do it. You want to do it. For the ooey gooey, puffy uffy. Breakfast needs more of that, you know? 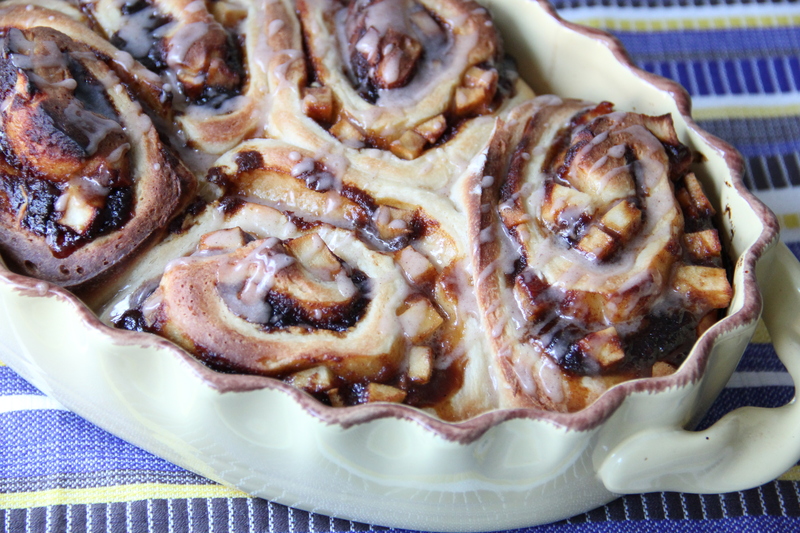 The filling for these rolls uses two forms of apple for maximum flavor: apple butter (I used store bought, but by all means, make your own if you like) and finely diced apples. The lemon zest in the dough and filling gives the rolls a bright, warm flavor, so don’t skimp. For the dough: in a small saucepan over low heat, warm the milk to about 95 degrees (it should feel very slightly cooler than body temp when you dip in your finger). Pour the warmed milk into the bowl of an electric stand mixer fitted with a paddle attachment. Stir the sugar and yeast into the warm milk and let sit for 5 to 7 minutes (the yeast should foam and bubble). After frothy, add the butter, eggs, lemon zest, and salt to the yeast mixture. Add 4 cups flour. Beat on low speed with the paddle attachment for 2 minutes. Stop the mixer, scrape down the sides of the bowl, and replace the paddle with a dough hook. Beat with the dough hook on medium speed for about 10 minutes. Dust a clean counter with flour. Scrape the dough out onto the work surface. Sprinkle with 1/4 cup of flour and knead for about 2 minutes. Your dough should be soft and slightly sticky. Place dough in a large, lightly oiled bowl. Sprinkle a bit of flour on top of the dough, cover with plastic wrap and a kitchen towel, and place in a slightly warm place to rise for 1 to 1 1/2 hours. 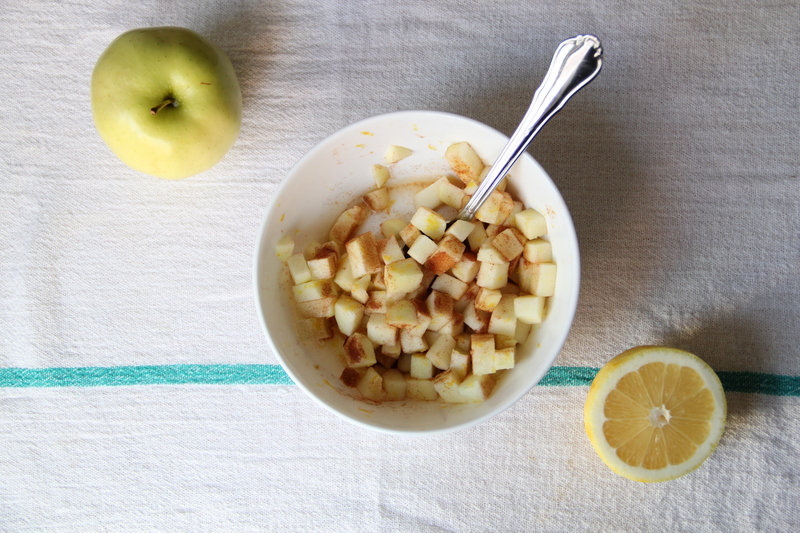 To make the filling, mix the chopped apple, lemon juice, zest, and 1 tablespoon cinnamon sugar. 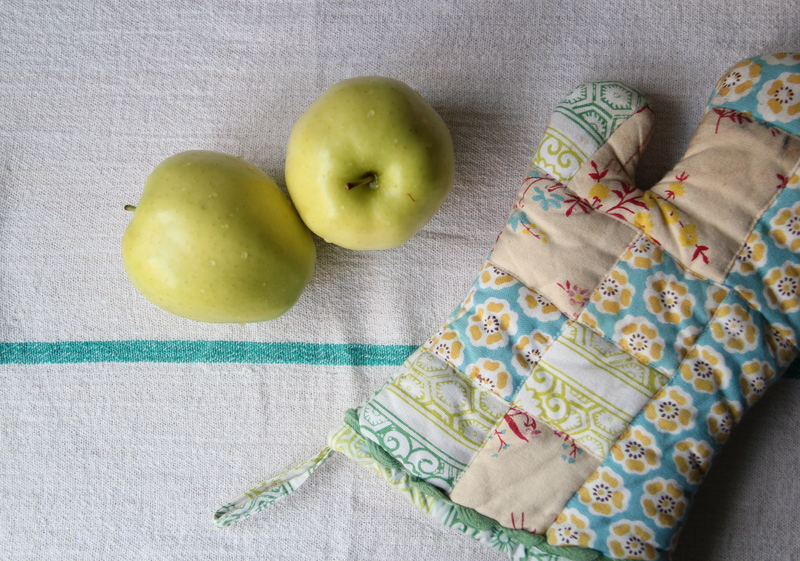 Set the apples, butter, and apple butter aside until you’re ready to fill and roll the dough. Once the dough has risen and is almost doubled in size, turn it out onto a lightly floured counter. Sprinkle it with a bit more flour and use a rolling pin to roll the dough into a large rectangle, about 1/4-inch thick. Using a sharp knife, cut the log in half, and then keep cutting your halves in half, until you have twelve pieces. Arrange the pieces, spiral-side-up, in a large, buttered baking dish, giving each roll a bit of room to breathe, and then cover the pan with a clean kitchen towel and let the rolls rise in a warm spot for 1 hour, until puffed. Once puffed, bake the rolls in a 400 degree oven for about 30-35 minutes, until golden and bubbling. Let cool for about 20 minutes, while you make the glaze. To make the glaze, whisk the powdered sugar, cinnamon, and lemon juice together in a small bowl until smooth. Drizzle the glaze over the warm rolls and serve immediately. The rolls are best eaten the day they are made, but will last for about three days tightly wrapped. Makes about 12 apple cinnamon rolls. We’re looking for a few talented three-year-olds for our staff. 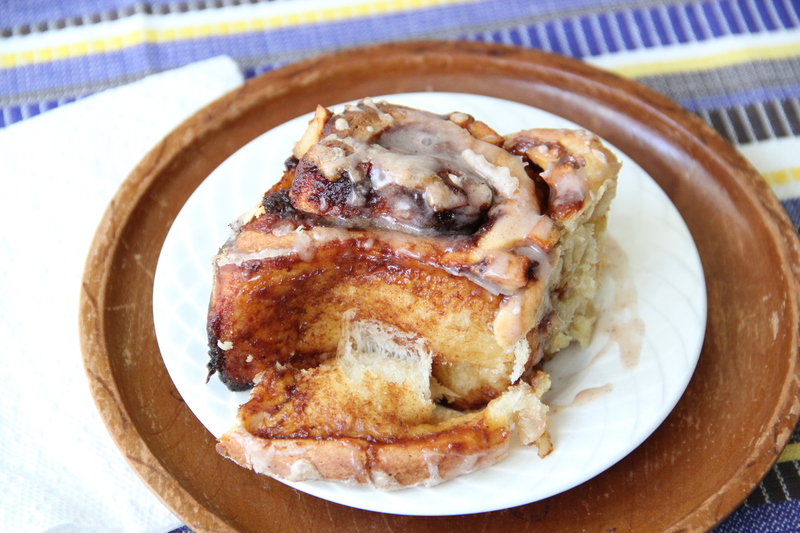 You know, to make ooey gooey, sticky licky cinnamon rolls for our breakfast. Got any recommendations? Thank you! I could recommend a few. how cute do you want them? These looks amazingly dangerous, Molls! Can you make them for me???? I ATE SUCH! It was hexcellent!